Margaret Morris was baptized 23 January 1814 in St. Lawrence Church, the parish church in Blymhill, a small village in western Staffordshire. 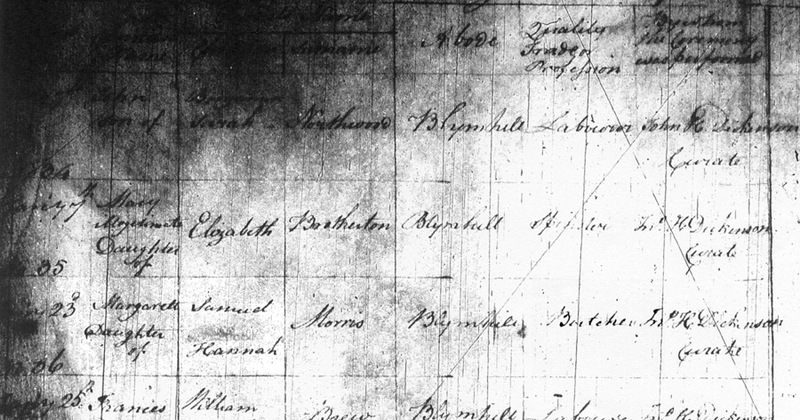 Margaret was the fifth of seven children of Samuel and Hannah Morris. Her father was a butcher in Blymhill. Margaret married John Horatio Robert Bayley in 1835 in Old Swinford, Worcestershire, England. Their oldest son, Hamlet Ambrose, is my ancestor. Source: Bishop's Transcripts for Blymhill, Staffordshire. FHL MF 426494, item 2: Baptisms, Marriages, and Burials, 1809-1868. Copyright © 2002-, Anne Healy Field, all rights reserved.